with the centenary of the organisation’s arrival in Australia. in New South Wales and in Adelaide in South Australia. ‘We’ve been celebrating like billy-o here in Sydney,’ Michael Newton Executive Director of WEA Sydney says. 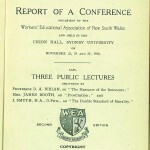 Centenary celebrations included guest lectures by advocates of adult educationsuch as Hugh Mackay, a formal birthday party and civic reception allof which have celebrated the role of WEA in Sydney’s intellectual and cultural life. It’s been great to reflect on and acknowledge the role of the WEA. Over in Adelaide the centenary kicked off with a series of master classes, talks, tours and exhibitions. At a recent civic reception, WEA’s 450 tutors were recognised for providing 1600 different classes to the current crop of 26,000 students. Fourteen more were recognised for having taught for 30 years, and another ten for having notched up quarter of a century of teaching at the WEA. 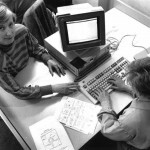 ‘Our tutors are our lifeblood,’ says Sue Ross, CEO of WEA South Australia. Today’s offerings includes overseas study tours, services to assist people with a disability enter mainstream courses, and a range of WEA clubs so students can continue to meet and share interests. The centenary celebrations in both states have highlighted the impact of the WEA on the its communities. In Adelaide, the Royal South Australian Society of Arts recognised the WEA’s art tutors with a recent exhibition that celebrated the WEA’s centenary. ‘Lasting impressions’ was a retrospective of work by artists including Ruth Tuck, Marjorie and Sophie Hann, David Dridan, Thomas Gleghorn, Dora Cant, Brian Seidel and Malcolm Carbins.